Comments: As a 30-year veteran of the Navy Reserve who vividly remembers the end of WW 2 as a pup when my parents took me down to Chicago's Loop for the massive celebration, I think Jim Ruddle is right on the money. I think its also a variation of the old "too many cooks spoil the broth" idea, too. Tell that to Congress, though, because the mood there over the years has been to increase some "Days" and create others. Comments: We still wear poppies, but on Memorial Day, the equivalent to Remembrance Day. Which brings up a small cavil I have with the way things have changed in this country. Memorial Day is supposed to be a day to honor those who died in service to the nation, while Veterans' Day is to recognize all those who served in the armed forces. Now, Veteran's Day has become confused with Memorial Day and has become a second, and it seems to me, inferior day of memorializing those who died in service. Memorial Day apparently began as a tribute by some southern ladies to the Confederate dead, and was quickly adopted in the North, at first--and for a long time--called "Decoration Day," referring to the act of decorating graves with flowers. Veterans' Day is simply an outgrowth of Armistice Day, commemorating the end of World War One, which evolved into Veterans' Day because of the millions who have served the country in all the years following. Personally, I'd like to see Memorial Day reserved for remembrance of those who lost their lives in service, and Veterans' Day obsrved, as long as politicians think it's necessary, to note that millions of Americans have fulfilled the duty expected of all able-bodied citizens. Comments: I never knew this about Paul Harvey till recently, but his real name is Paul Harvey Aurand (Aurandt). If you want, check that out. He is as old as the hills, and his son is in the radio business too. The Native Tulsan is a real gem of man, too. His name alone has world recognition. I also found out that he lost his voice for about 2 months or so in the last 2 years, but came right back to radio. Comments: I was just reading in the last guestbook pages where someone had been reflecting on wearing red poppies for "Veterans" or "Remembrance Day." I seem to remember wearing them as a kid growing up in Tulsa. Here in Toronto, you can see the poppies everywhere! Even the news anchors and reporters wear them on-air. I think it's a fabulous tradition. Too bad it doesn't happen in the STATES anymore. You can pick them up at local fast food restaurants, fine dining and covenience stores all across Canada for a small donation. The money goes back to the Vets. It certainly makes you pause and be thankful for the Great Men and Women who have fought, died and continue to fight for our freedom in North America! Comments: Just saw on Yahoo News that former Tulsan, Paul Harvey, was awarded the Presidential Medal of Freedom Award. This is the highest honor that can go to a civilian. Congrats to Paul Harvey!! Here's the link to the article. Paul is listed at the bottom of the page. 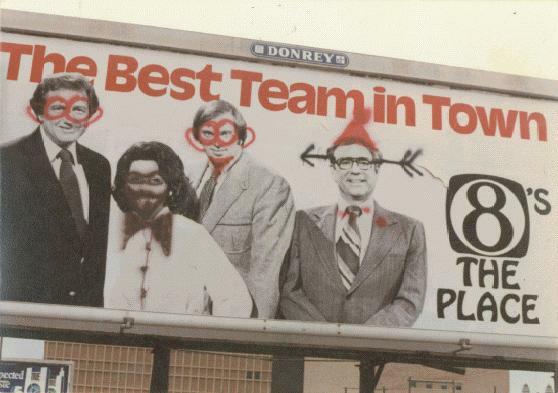 Comments: Here is a small Donrey billboard posting an "8's The Place" campaign ad located across the street from the KOTV studio in downtown Tulsa. It was revised by some revelers from my bachelor party in September 1979. "Anyone remember in the 70s a radio station had a treasure hunt and would give out clues on air to find it and people were digging up yards and graves looking for it? It ended up being at the Ma-Hu mansion across from Oertle's in the front by the rock fence." Oh yeah, I remember. Oddly enough I almost found the treasure, which I think was a 1000 dollars. One of the clues had something to do with 13 guards or sentinals looking over the treasure. I remember me and my girlfriend figuring out that it was at Ma-Hu because there were 13 fence posts. We hopped in her '69 Camaro and hurried over to look for it. When we arrived someone else was there looking for it too. We were about 10 feet from the other people when they yelled they found it. It turns out they had seen someone digging there the week before and put 2 and 2 together. 5 minutes earlier and I would have found it. I always felt a little screwed on that deal. It was either in '78 or '79. Comments: I've been meaning to post this for a long time. Remember the Ma-Hu mansion at 26th and Memorial? Unfortunately it's long since been torn down and replaced with a housing addition. In 1978, after vandals and Scream in the Dark had taken its toll on the mansion, it was torn down. All that remained of the once proud estate was the massive wall, that I believe enclosed a huge stone barn behind the main house, and the long stone driveway that led up from Memorial Drive. Fortunately I was able to rescue some of the rock and use it for landscaping and on the front porch and entry of the house I used to live at in Tulsa until 2001. With permission, me and a friend of mine made several rock saving expeditions to Ma-Hu in the late 80's. We mostly took the rocks that capped the top of the wall but we also got them from the driveway, around the top of a well and from the curved entry steps on the south side of the wall. The cool thing is that we used the curved stones from the south entry on the front porch of my house. I used to imagine all the people that had walked on those steps over the years, especially during Ma-Hu's heyday. From what I've read, a man named Frank Reed, a stone mason, built the house. From what I saw of his rock work, he was very good. Every piece of rock we liberated was meticulously placed. Awesome craftsmenship to say the least. At the time I felt somewhat guilty chipping away the rocks and removing them from where they had been for so long. Now that it's all been bulldozed, I'm glad I was able to save even a small part of Ma-Hu. The person that bought my house has no idea of the origin of the limestone rocks that adorn the front of the house. Even if I told them, I'm not sure they would appreciate it like I do. Leaving the rocks behind was very difficult. I like to think some of the energy from Ma-Hu survives in that rock. If you want to see the surviving Ma-Hu rock, the address is 1544 South 139th East Ave. It's in the neighborhood just east of Harvey Young Airport. Comments: I would kill for a Goldie's Hamburger right now! Comments: Utica Square was "out in the country" when I was a lad. Wolferman's was Tulsa's prime purveyor of fine food going back at least to the mid-forties, but it was situated on 15th Street, just west of the Midland Valley RR underpass, on the opposite side of the street from the Pig Stand. I, and lots of others, walked to school at Horace Mann along the Midland Valley tracks to 15th, then down to Cincinnati and on to the red brick holding pen. In the mornings, it was almost torture to pass Wolferman's because the on-site bakery perfumed the air with the most tantalizing aromas I've ever encountered. But Wolferman's was pricey, for those times, and even then competition from Safeway was hammering the independents. Comments: Go to the Tulsa Press Club & look on the wall where you find Betty Boyd......you will find a very young edwin behind a GE cam. less 80lbs. & less 38 years......whata hoot! Comments: The PR depart. of TPS sent me to shoot the final voting thingy tonite about the vote thingy......why in the world would any of the creatures on this planet shoot news? It was a boring job!...I would rather put together a package of what happens AFTER the fact.....comments wanted....since I don't get it...I am, after all, a production person!...not news. Comments: I believe that bobcat is a lynx leading us to the 'links' page. Should have a photo of Link from the Mod Squad. That's right. Betty Boyd is on the little TV screen, so that's a Tulsa TV. Beside it is a puzzled-looking lynx who would probably enjoy a tasty rabbit, but not a TV with rabbit ears. Tulsa TV links. Probably too cryptic to be a good icon. Comments: What is the significance of the photo of the bob cat with the red TV set in the background? It is shown on Channel Changer 1. It seems vaguely familiar, but I can't quite place it. Can anyone help me out? Thanks. Comments: Remember Wolferman's at Utica Square - later became Petty's Fine Foods? Wolferman's stayed in business in KC though. They are mailing out Xmas wishbook catalogs and somehow I got one - seems like their big sellers are all kinds of exotic English muffins or flavored loaves with jam. BTW after my first Texaco card at TU in 1972 - I opened a Petty's charge at Utica Square. When KTUL paychecks were stretched thin - I would go to Petty's and put milk, bakery and deli stuff on the cuff. $100 was the max one could charge in the 1970's! Comments: I visited Molly Murphy's in 1984 while on tour with Tanner '84 FreeFare. Better known as 'the band from Florida'; we toured locally through Kansas and Oklahoma that year. A friend pointed out this site to me and I'm thankful to find others who know what I'm talking about when I mention Molly Murphy's Restaurant. Now if someone can help me find another establishment that furnishes similar service (preferably in the Atlanta area) I'll be really happy. Comments: Is that some kind of Italian prayer? More like Italian spam, which I removed. Location: Back at the Paladora...IN SPACE! Comments: I was downtown Friday and noticed that the giant metallic robot somebody put in their yard (14th & Denver) for Halloween is still up! If you haven't seen it, I recommend you take a look. It will be a question in these pages thirty years from now. Comments: Saw where Jim Hartz (Today Show) was back in town this past weekend for some type of benefit. Still handsome with a great sounding voice. Comments: I was reading about the Coffee Houses of Tulsa and thought I'd add a note or two. The Purple Cow was located at approximately 42nd & Peoria (nearer 41st St., but not on the corner) in an old house that was very colorfully decorated. The Par Three Trio played for the opening night of the coffee house. The Par Three Trio (named after the golf course behind the hamburger restaurant at 51st. & Lewis that is now Goldies) consisted of: Keith Hunt, piano; Mike (Magoo) McGoffin, drums; J. Martin (Moby) Anderson, bass; and that night we had David Bartlett, on trumpet. The Par Three Trio Played jazz in and around Tulsa from 1959 until about 1962. The opening evening at the Purple Cow was hampered by the lack of a piano! The piano was supposed to have been delivered but it had not arrived by the time we were scheduled to play. Keith just happened to have an ACCORDIAN in his car's trunk. He brought it into the room (which had pillows all over the floor), laid it flat on the floor, put his leg through one strap. Then we enlisted volunteers to pump the accordian while he played it like a piano! We had to change 'pumpers' often, but that worked unitl the piano arrived! It is one of my favorite memories of playing music in Tulsa. Moby, nice to hear from one of the originals. I added your comments to the Tulsa Coffee Houses page. Comments: I recently heard that Wayne "Tuffy The Tiger" Johnson has been in bad health. How is the ol' tiger doing? I met him once via a lifelong friend whose sister was married to Tommy Crook. I have a ton of memories of times spent at Tommy's house on the westside on South 33rd. The different people I had the pleasure of meeting and getting to hang out with. But one of the nicest people I ever got to meet was Wayne. Please let me know how he is doing. Comments: Archived Guestbook 195, where we just heard from Jim Ruddle about TV people missing out on TV content, illustrated by a meeting with Daniel J. Travanti.